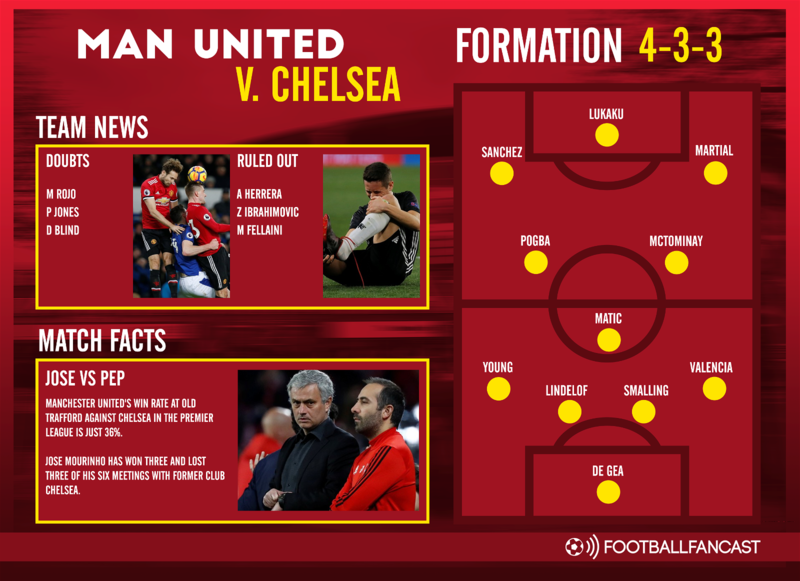 Manchester United will be more than aware that defeat to Chelsea this Sunday would only increase the looming negativity at Old Trafford, especially after a shock defeat to Newcastle and an incredibly underwhelming performance against Sevilla in midweek. But Jose Mourinho will need to achieve it without some noteworthy personnel. Ander Herrera has been ruled out after limping off in the Champions League, while Zlatan Ibrahimovich and Marouane Fellaini – two players who give United imperious threat in the air – won’t be involved either. Meanwhile, centre-backs Marcos Rojo and Phil Jones are serious doubts as well as utility man Daley Blind – although he’s not seen much action this season anyway. Accordingly, it feels like Mourinho’s hands are somewhat tied in terms of team selection, especially bearing in mind the whole debacle over Paul Pogba being part of a two-man midfield. We’re expecting a trio in the middle of the park on Sunday, with Nemanja Matic just behind and promising youngster Scott McTominay alongside as the France international – who Transfermarkt value at £81million – returns to his apparently favoured left central midfield role. Jones’ injury will likely result in Victor Lindelof partnering Chris Smalling at the back, with Eric Bailly only just returning from injury and probably not sharp enough to start just yet. But perhaps the real point of contention is on the right wing; Jesse Lingard, Juan Mata and Anthony Martial could all feasibly start on the right of the attack, but we’re backing the latter wide man who has netted nine times in the top flight this term.